The Matrix meets Inner Space in this third book in the BZRK trilogy from New York Times best-selling author Michael Grant. 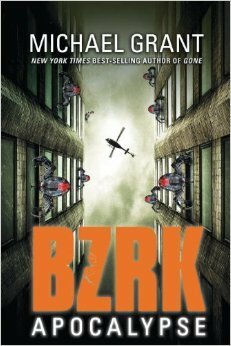 The staggering conclusion to the BZRK trilogy, from the author of GONE. The members of BZRK are preparing for their final stand, in the world's capitals and in the nano. Expect the unexpected in this novel packed with the author's trademark jaw-dropping action, violence, and pace. Michael Grant has spent much of his life on the move. Raised in a military family in the USA, he attended ten schools in five states, as well as three schools in France. Even as an adult he kept moving, and in fact he became a writer in part because it was one of the few jobs that wouldn't tie him down. His dream is to spend a whole year circumnavigating the globe and visiting every continent. He lives in Marin County, California, with his wife, Katherine Apple-gate, their two children, and far too many pets. You can visit him online at www.themichaelgrant.com. These are the books that the boys have been looking for!! Really if you have a boy or well if you are a boy then this series is for you!! With non stop action you will be diving into these pages. Ties up loose ends very well. I'm going to check out this series.